As governments are pushing to weave bits of emerging technology to cultivate smart city in their countries, integrating pipelines continues to feature at the top of the priority list. Embedding enhanced technological features such as advanced sensory for the in-inline inspection of the oil & gas pipes, drone monitoring and distributed acoustic sensing. Integration of advanced sensory and machine learning has brought in new technological breakthroughs benefitting the pipeline operations. 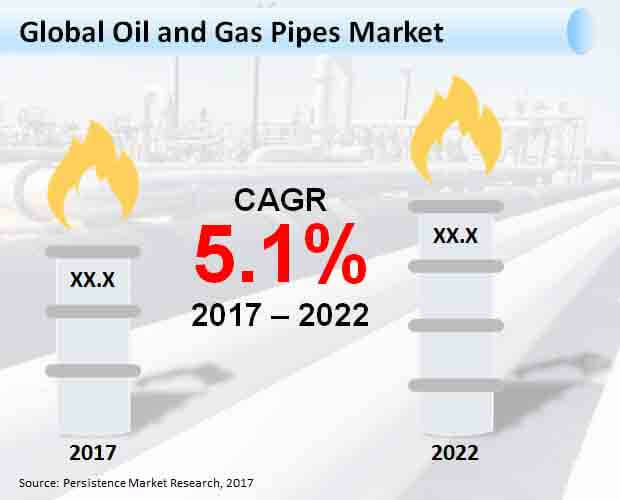 According to Persistence Market Research, the global oil and gas pipes market is expected to represent a value of over US$ 4,000 Mn by the end of 2022. Emergence of advanced techniques for smooth and protective transportation of the oil and gas materials has led manufacturers to adopt enhanced technology such as Internet of Things. Integration of Internet of Things enables the manufacturers to integrate analytical capabilities and sensing communication in the oil and gas pipes. The offshore and onshore end users will continue to capitalize on benefits of the smart technology embedded in the piping system as it provides and retrieves data related to transportation. Increasing number of the shale oil and gas extraction projects has significantly contributed towards the drilling projects. Surge in the number of extraction and drilling projects has led to a growing need for transporting water, chemicals, sand and various other materials. Transportation through trains, ships and other means has meant increasing expenses attributed to growing fuel costs. As government in various countries are taking initiative to ensure environment friendly techniques, manufacturers are increasingly using oil and gas pipelines for internal processing and transportation process. Bound to these factors, demand for the oil and gas pipes will continue to increase globally. Manufacturers are increasingly using oil and gas pipelines and steel pipes for transporting the materials safely as it could be subject to the extreme temperature conditions and corrosive environment. Moreover, surge in demand for transporting the oil and gas materials from production area to the larger main pipeline or a storage area is expected fuel the sales of the oil and gas pipes in the global market. Emerging technology has further redefined the concept of pigging. Embedded with smart technology, the intelligent pigging technique performs enhanced inspection activities including magnetic flux leakage testing and ultrasonic testing through. Through these technologies, the intelligent pigging technique inspects pitting, erosion corrosion, hydrogen induced cracking, metal loss and welding anomalies. These techniques are also used to gather information on the bends, diameter, temperature and curvature of the pipeline. On the other hand, end users prefer opting for piping system integrated with advanced technology for safe transportation of the material and services. Installation of the oil storage devices, gas stations and pipelines equipped with advanced technology leads to high investment. Moreover, piping system integrated with enhanced technology requires maintenance at particular intervals, which will add to the overall expenses. These factors are likely to impact growth of the global oil and gas pipes market negatively over the forecast period. Growing preference for protective and robust pipes that keep the transport of the oil and gas materials safe has led to increasing adoption of stainless steel materials for constructing the oil and gas pipelines. On the basis of material type, the stainless steel segment is expected to generate significant revenues, accounting for over US$ 900 Mn by the end of 2022. Moreover, this segment will register the highest CAGR in the global market throughout the forecast period. The offshore activities will continue to witness comparatively more revenues than through the onshore activities. By end users, the offshore activities segment is expected register the highest CAGR, representing a value of over US$ 600 Mn in the global market by the end of 2017. Based on application, the external transportation and distribution segment is expected to represent the highest revenue growth, recording a value of over US$ 900 Mn by the end of 2022. The external transportation and distribution application type segment is expected to register a robust CAGR in the global market throughout the forecast period. Leading market players operating in the global oil and gas pipes market include Tenaris S.A., Valourec S.A., Mexichem Sab de C.V., Metalurgica Gerdau S.A., JSW Steel Limited, JFE Holdings Inc., Aliaxis Group S.A., China Steel Corporation, American Cast Iron Pipe Company and Arcelor Mittal S.A.